Re-Reading J.R.R. 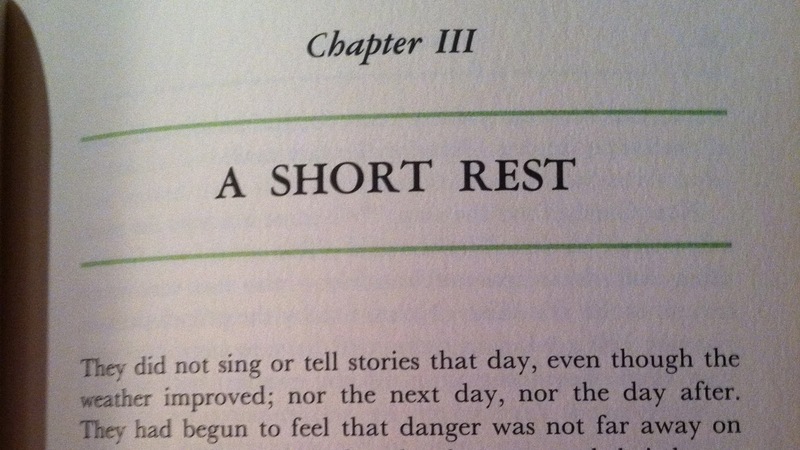 Tolkien's "The Hobbit" - Chapter Three: A Short Rest – Most Astonishing Wonderful! This December, director Peter Jackson is finally returning to Middle Earth with “The Hobbit: An Unexpected Journey,” and to celebrate, I’m revisiting J.R.R. Tolkien’s beloved classic novel, “The Hobbit,” for the first time since second grade, and I’m inviting you, my readers, to follow along with me! Every Tuesday and Thursday, I will be covering a new Chapter. 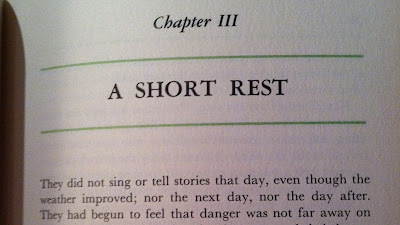 Today, we continue with Chapter Three: A Short Rest. I’ll give you some general impressions, a brief summary of the action, and then a long laundry-list of various specific thoughts about the story, the characters, Tolkien himself, and the upcoming film. As I’ve been saying in the pre-jump intros, I haven’t read “The Hobbit” front-to-back since second grade. I can’t say for sure why. I really love the story, and perhaps I’ve subconsciously been restraining myself from overexposure. If that’s what I was doing, it’s been working, because it’s really quite fun to read one of my favorite books again and have it all feel new again, to have that sense of wonder and discovery intact. Most of what I’ve found myself remembering or recognizing so far are vague generalities, or random little character beats that have been rattling around in my brain for over a decade. But one of the things I’ve always strongly remembered about “The Hobbit” is the pit stops Bilbo and company make, the rests they take along the road with various friends and allies. These were my favorite scenes when I first read the novel; it’s simply fascinating, magical even, to be immersed in these fictional cultures Tolkien imagined. An illustration from the novel - click to enlarge! 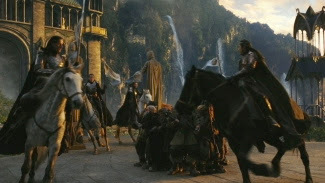 Rivendell in the upcoming film "The Hobbit: An Unexpected Journey"
After their encounter with the Trolls, the company continues on their journey, quickly reaching the Misty Mountains. Gandalf decides they should take a short rest before journeying through this vast mountain range, so he leads them to the valley Rivendell, where they find the Last Homely House, home of the Elves. 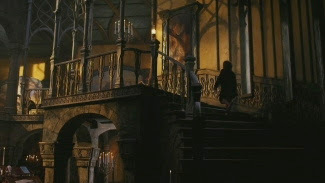 Elrond welcomes them, and the company feels so comfortable and pleasant that they stay for two weeks. 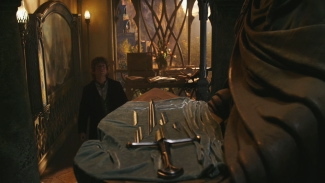 Before they leave, Elrond reads the runes on the swords Gandalf and Thorin found in the Trolls’ hideout, and discovers that they are two legendary blades, Glamdring and Orcrist. Elrond also reads the Moon-Letters on Thorin’s map – a form of runes – and discovers a crucial piece of information about the Lonely Mountain. Rested and satisfied, the company continues on their journey. The company arrives in Rivendell in "The Hobbit: An Unexpected Journey"
Continuing with the Hemingway parallels, Tolkien’s description of the Misty Mountains, now that Bilbo and friends encounter them, is not hugely expressive, but it’s a passage that fills me with awe. I remember being amazed by the Misty Mountains in my youth, and I got the same feeling during this reading. It’s more Bilbo’s reaction than anything else. As Gandalf explains where they are headed – the Last Homely House, Bilbo thinks, “That [sounds] nice and comforting.” Indeed it does. The geography of getting to Rivendell is very illuminating for me, because I’ve always been more familiar with “Lord of the Rings,” and when Frodo journeys there, he’s passed out from the Ring-wraith attack, so in the book and the movie, we don’t see him arriving at the House. 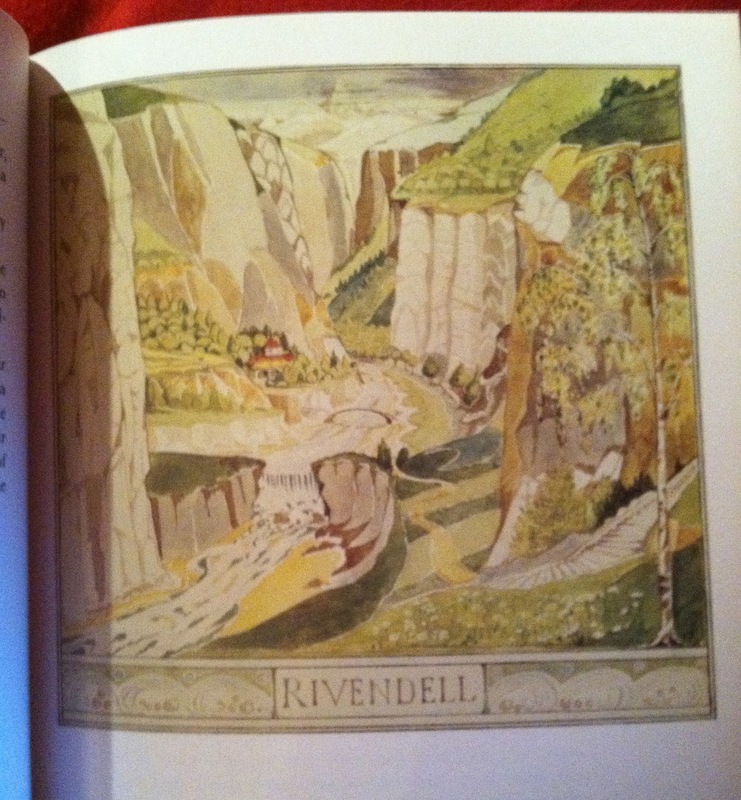 This passage in “The Hobbit” makes a few things clear for me, that Rivendell actually lies inside the Misty Mountains, that it’s a maze of a hike to get there (it’s implied that only those who know its location, like Gandalf, would have a chance of finding it), and finally, that Rivendell is actually the name of the valley, not Elrond’s home. I’d always thought they meant the same thing. Of the course the Elves introduce themselves with a song. Of course they do. I remember this whole passage in vague terms, the emotional wonder of entering Rivendell. Again, the emotions of reading “The Hobbit” are very much in line with Bilbo’s thought and feelings, the awe, the amazement, the fear, etc. It’s about discovery, and Bilbo is discovering these strange new lands the same way we are. The elves are so very interesting in this book; they are quite silly, frivolous, fun-loving people fond of mockery and always jubilant. When they meet Bilbo, they actually say the words “Most Astonishing Wonderful,” which should really have been the name of a sixties psychedelic rock band. In later Tolkien stories, the elves gained an air of mysticism, but here, they’re just fun-loving, kind creatures, and the Dwarfs dislike them not for any deep-seated racial prejudices, but because they find the Elves foolish. This is an awesome passage:“So [the elves] laughed and sang in the trees; and pretty fair nonsense I daresay you think it. Not that they would care; they would only laugh all the more if you told them so. They were elves of course.” Of course. Quint from “Ain’t it Cool News” has been travelling Middle Earth….I mean, New Zealand, with Peter Jackson and the “Hobbit” crew as the film the movie, and his set reports have been fascinating. This is the report that pertains to this chapter, Quint reports watching the filming of a conversation between Thorin and Gandalf where Thorin must be convinced to seek refuge in Rivendell because of his race’s deep-seated hatred of the Elves. This is a big departure from the novel, but a completely necessary one, I think. Thorin needs to fleshed out more in the movie at this point than he is by this chapter, and it sounds like that scene will showcase his leadership qualities and strong convictions. More importantly, it’s good for Jackson to delve further into the history of the feud between elves and dwarfs, because while Tolkien didn’t have it all planned out when he wrote this Chapter, he did for “Lord of the Rings,” and if Jackson didn’t incorporate some of that into his “Hobbit,” we’d be getting some glaring continuity flubs. “And so at last they all came to the Last Homely House, and found its doors flung wide.” They arrive, and spend fourteen days there, a detail I had forgotten, but Tolkien did enjoy dealing with long time-spans. The company simply fall in love with the place, and I as explained before, the readers do as well. For some reason, I had remembered this chapter occurring later in the book, and I think it’s because Rivendell is such an amazing place that my mind has just been assuming all this time that Tolkien built up to it more. Martin Freeman as Bilbo Baggins in "The Hobbit: An Unexpected Journey"
Here’s a passage that sums up the hypnotic wonder of this chapter: “[Elrond] was as noble and as fair in the face as an elf-lord, as strong as a warrior, as wise as a wizard, as venerable as a king of dwarves, and as kind as summer. He comes into many tales, but his part in the story of Bilbo’s great adventure is only a small one, though important, as you will see, if we ever get to the end of it. His house was perfect, whether you liked food, or sleep, or work, or story-telling, or singing, or just sitting and thinking best, or a pleasant mixture of them all. Evil things did not come into that valley.” So well-written, so many things to notice: One, that this description of Elrond plays a big part in making him such a legendary character, and re-reading it gives me even more respect for Hugo Weaving’s performance in the movies, which includes all of those descriptors. 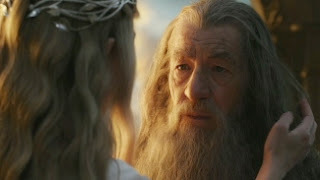 Second, that Tolkien’s main talent here lies in being the storyteller, giving it all a very personable feel, and little touches like “if we ever get to the end of it” give “The Hobbit” a very unique, one-on-one atmosphere, like a Grandfather is telling you a bedtime story. 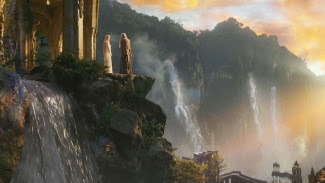 Third, that the description of the pleasures of Rivendell have always held a place in my mind; it is simply a magical place and one of my favorite parts of “Lord of the Rings” is the extended time we get to spend there during Frodo’s journey, fleshing out everything Tolkien hints at here. Bilbo explores the Last Homely House in "The Hobbit: An Unexpected Journey"
Since Elrond knows runes, we learn about the swords. Glamdring and Orcrist both come from the “…High Elves of the West, my kin. They were made in Gondolin for the Goblin Wars. They must have come from a dragon’s hoard or goblin plunder, for dragons and goblins destroyed that city many ages ago.” The naming of Bilbo’s sword, Sting, will come later. The above passage was slightly revised for the third edition of "The Hobbit," published in 1966. Tolkien originally wrote "Elves that are now called gnomes, my kin," but changed it to "High Elves of the West, my kin." According to Wikipedia, the change was made due to confusion over the term "Gnome." In both cases, Elrond is talking about the Noldor - "Deep Elves" - who are old and very wise. Tolkien therefore derived the term "Gnome" from the Greek gnosis, or Knowledge. By the time the third edition rolled around in 1966, however, Tolkien had abandoned the term due to confusion with common garden gnomes, and the change was reflected in the new text. Cate Blanchett and Sir Ian McKellan in "The Hobbit: An Unexpected Journey"
Come back on Thursday, February 9th, with “Chapter Four – Over Hill and Under Hill” read so that we may take one step closer to Gollum!